"Shark week" is the first week of august. It is a week design to raised awareness on these great animals and to contribute in the fight against conservation of these species. This worksheet has a reading comprehension, and a writing. You can also show your students books about sharks before and after the class. 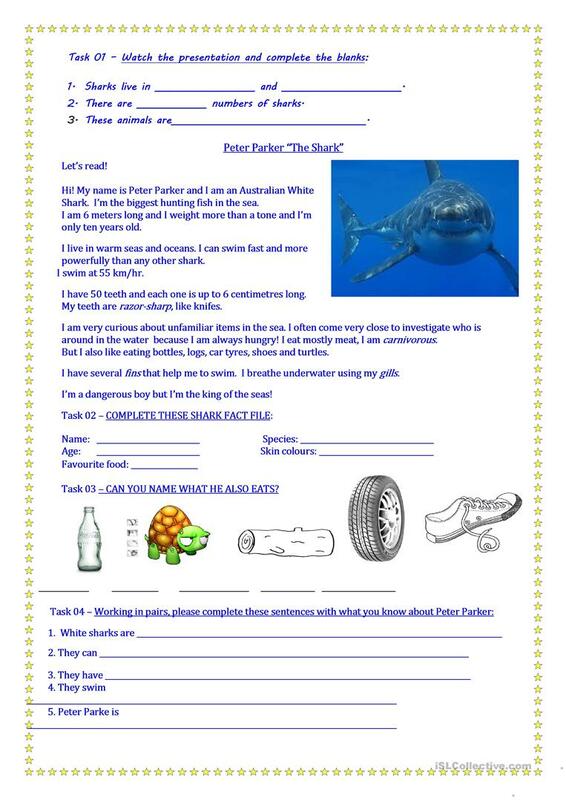 "Shark week" is fun and your students will love it. The present printable, downloadable handout is recommended for high school students and elementary school students at Elementary (A1) and Pre-intermediate (A2) level. It is aimed at practising Present simple vs continuous (progressive) tense in English, and is excellent for developing your pupils' Speaking, Reading and Writing skills. It is about the topic and words of Animals. I teach English in Primary School. Mostly to 2nd, 3rd and 4rd graders. I love teaching topics about marine conservation, oceans, seas, dolphins, sharks, whales and many other sea animals.